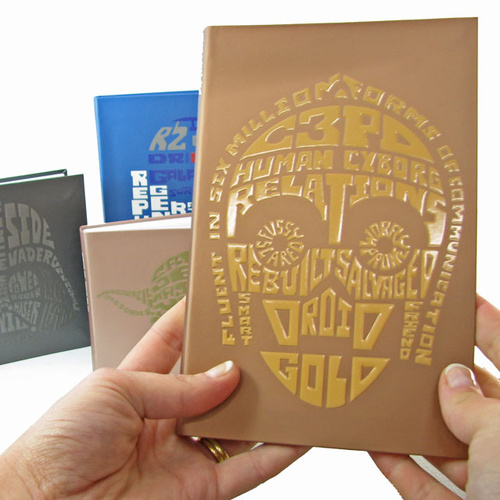 Star Wars C-3PO Notebook | A must have for any aspiring protocol droid! With Star Wars Episode 7 hitting cinemas next year, a new generation will be fighting to get their hands on Star Wars merchandise! Each notebook in this four-book collector's series is based on an iconic Star Wars character. True fans will have to "use the force" not to buy them all in one hit! With a luxurious embossed finish and futuristic design, your lined C-3PO notebook is a must have for every droid fan, with a small Star Wars logo featured on the bottom of each page. Also available: Yoda, R2-D2, Darth Vader.